Within this book, art students, professional illustrators and creative amateurs alike will find inspiration and encouragement to develop core skills and embrace innovative digital techniques. Each page in this book is packed with easy-to-follow, step-by-step guidance that focuses on how to create better human and creature figures. It includes eight detailed workshops devoted to drawing and painting the human body. Each workshop presents easy ways to master the art of drawing and painting human anatomy, with practical advice from head to toe. Artists will learn how to create basic forms, and improve figure drawings by establishing the underlying structure of the human body. Clear instructions are provided for depicting challenging areas, from feet, hands and torsos to legs, heads and arms. Six additional workshops provide practical guides to animal anatomy. The authors describe how to discern the shapes beneath animal skin and fur, revealing how the core of the animal body operates and how to use it to bring life to animal art. Artists will discover what animal faces have in common with human faces, and the crucial ways in which they differ. 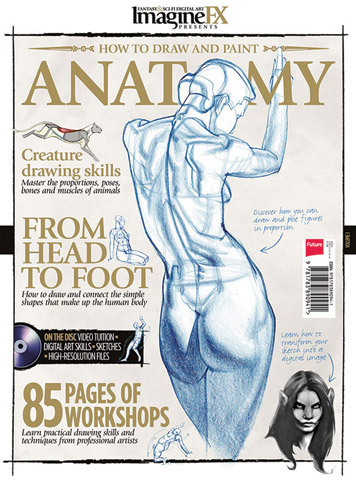 An accompanying CD supports the anatomy and painting workshops with the opportunity to get closer to the annotated sketches, watch videos of anatomy drawing in action and examine high-resolution art files that illustrate how to develop digital software skills.